The Mars Society is pleased to announce that the winner of the 2018 Mars Society Poster Contest is Bill Wright of Maryland (U.S.). The selection committee received over two dozen design submissions this year for review. 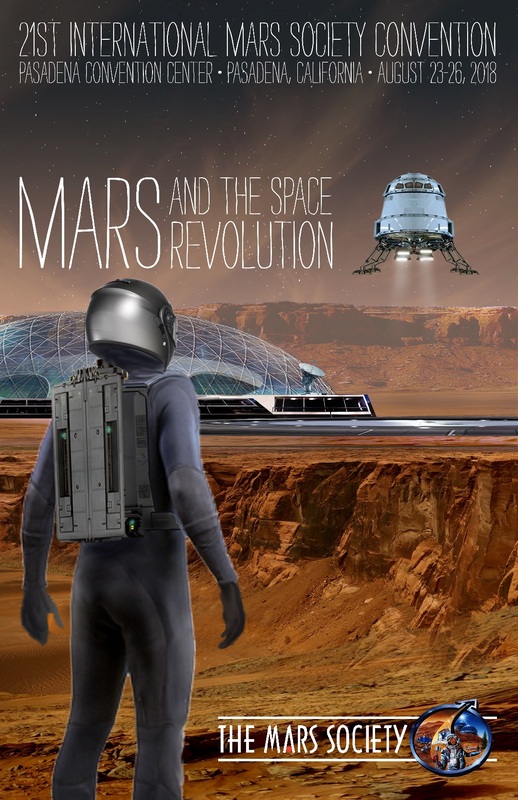 Graphic artists were asked to submit a poster using the theme “Mars & The Space Revolution” for the 21st Annual International Mars Society Convention, scheduled for August 23-26, 2018 at the Pasadena Convention Center. As always, the winning design will be used by the organization to help promote its four-day space conference. The Mars Society would also like to congratulate the second place winner – Ravven Kitsune – and two artists who tied for third place – Katherine Simpson and Bob Keller. In addition, contest organizers would like to thank all of the talented participants in this year’s poster design competition. For more information about the 2018 International Mars Society Convention, including online registration details and call for papers, please visit our web site.